Mairead Hurley and Nathan Gourley met in Dublin, Ireland and bonded over cider, similar last names and a love for old-school traditional Irish music. Mairead, hailing from Sligo, Ireland is an All-Ireland champion on concertina. She has toured worldwide - her most recent musical adventures being on the vibrant folk scene in Australia. She spent 2014 teaching Irish music in Sydney, and is now based in Melbourne. She recently appeared as a special guest on a number of occasions with Irish-Australian stalwarts Trouble in the Kitchen. 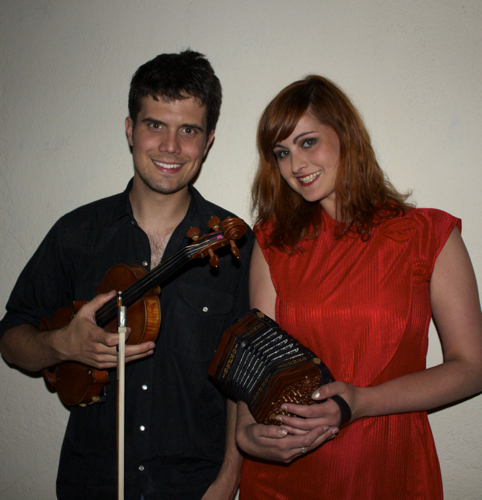 Nathan on fiddle is a household name in the Irish music scene in North America. While living in Minnesota he had the opportunity to collaborate with such renowned players as Paddy O’Brien of Chulrua and Dáithí Sproule of Altan. Now a resident of Boston, he has just released a celebrated album with fellow fiddler Laura Feddersen, and their album launch performances have been receiving rave reviews across the U.S as well as air play on RTÉ Raidió na Gaeltachta in Ireland.